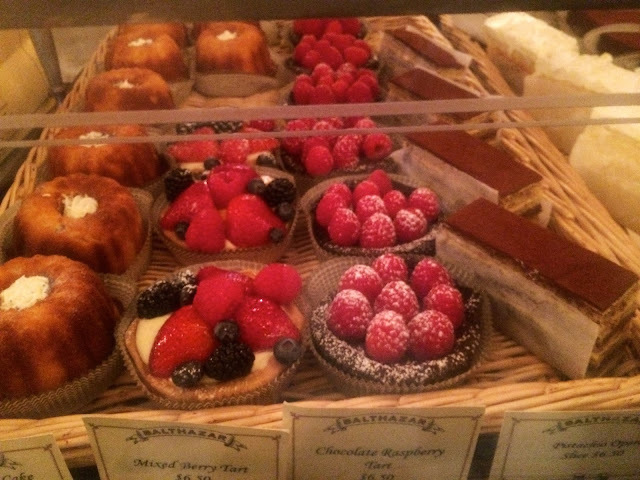 Miss Patisserie: A Sweet Stroll through SoHo! A Sweet Stroll through SoHo! A quest for the perfect macaron recently called me to New York City. I came for a French macaron-making workshop in Brooklyn at the Ecole Valrhona, the training program for pastry chefs that is part of the renowned chocolate company based in France. During my visit, I ventured out to explore the bakeries of Manhattan. The highlight was a stroll through SoHo, where I discovered a stylish hub of foodie delights and sampled some of the best desserts that I've ever tasted! Spend a few splendid hours exploring the sweets of SoHo. With its cobblestone streets and beautiful brownstone buildings, this quaint historic area is a wonderful escape from the concrete jungle of NYC. Once a Bohemian artists' quarter, SoHo is now an upscale neighborhood full of art galleries, designer fashion boutiques, trendy restaurants and exquisite pâtisserie shops! Begin this tour by walking from 6th Avenue to Dominique Ansel on Spring Street. If taking the subway, get out at the Spring Street stop. Dominique Ansel Bakery is a little gem of a pâtisserie shop in SoHo! 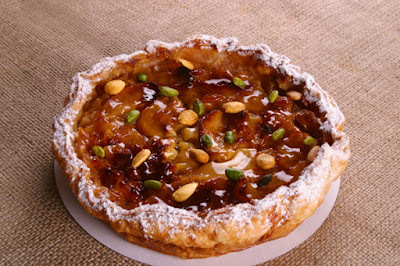 Dominique Ansel is a renowned French pastry chef with a long list of accolades. He made Dessert Professional magazine's list of "Top 10 Pastry Chefs in the United States" in 2009; Time Out New York described his pâtisserie shop as the "Best New Bakery of 2012"; and he won the James Beard Award for "Outstanding Pastry Chef." But he is most famous for creating the "Cronut," the croissant-donut hybrid that customers wait in line for every morning. Cronuts come in different flavors every month such as Rose-Vanilla in May and Blackberry-Lime in July. Although I did not arrive early enough to procure a Cronut, this did not detract from the joy of my visit. The assortment of pâtisserie is breathtaking, and both of the desserts that I tried were divine. My favorite was the refreshing Citrus Tart made with a buttery crust and pastry cream featuring citrus zest, topped with delicate wedges of oranges, blood oranges and grapefruit. I also tried Dominique's Kouign Amann (a.k.a. the DKA), a flakey croissant-like pastry with a crisp caramelized crust. The presentation of pastries at Dominique Ansel is very appealing, with little baskets lined in natural linen. Everything seems so old-fashioned and homemade! You can really tell that all the pastries are baked with love in small batches. Dominique Ansel is so clever and really has a sense of humor. For instance, the cream puff pastry, normally called a "Religieuse" in French, is decorated like a little cat named "Coco." Ansel's creativity is also seen in his "After School Special," a chocolate chip cookie shaped like a cup and filled with milk, available at 3pm. Visitors can see the pastry cooks at work in the shop, because the kitchen has a clear window to showcase the handcraftmanship. They make it look so easy! On a warm day, you may sit outside on the shaded patio. Enjoy your delicious pastries while soaking up the peaceful ambience. It's a relaxing retreat in the middle of Manhattan. The legendary pâtisserie and tea salon from Paris, the Maison Ladurée founded its first North American location in SoHo, confirming the neighborhood's status as a place of taste and elegance. Under the helm of France's most acclaimed pastry chef Pierre Hermé, Ladurée perfected and popularized the macaron as a cookie sandwich. Ladurée in SoHo offers the standard of excellence on par with the shops in Paris, including the same refined serving pieces. Stopping at Ladurée SoHo for afternoon tea is like taking a mini-vacation to France. Bonne Visite! Vosges Haut-Chocolat is a fancy chocolate shop that focuses on exotic flavors. The ingredients are a bit weird and unconventional, like fennel seeds, rosemary, blackstrap molasses, cayenne pepper and blue green algae. It's definitely for the adventurous gourmand. Founder and Chocolatier Katrina Markoff invented the concept of "Travel the World through Chocolate". 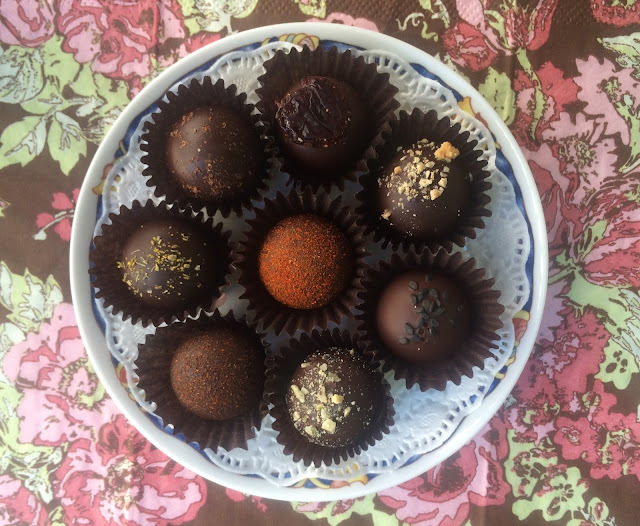 Many of the truffles reflect the spirit of an inspiring place that Markoff has visited herself. Normally I prefer more old-fashioned chocolate truffles filled with pralines and caramels. However, I did appreciate Vosges' Red Fire truffle featuring cayenne pepper and cinnamon. 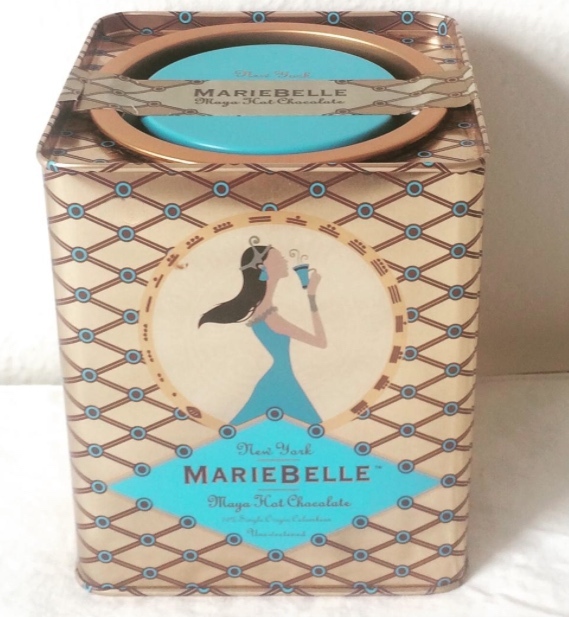 MarieBelle offers the ultimate in luxurious European-style dark chocolate. The dainty boutique has a refined look, complete with a sparkling chandelier. MarieBelle is known for its rich hot chocolate and exquisite truffles featuring charming decorations. 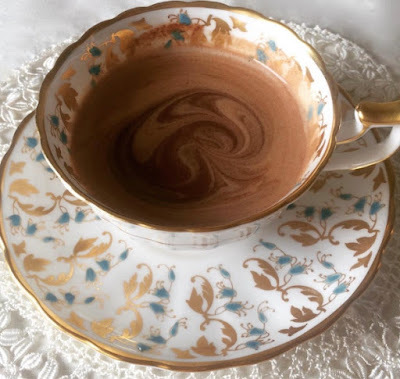 MarieBelle's award-winning hot chocolate is considered the best in New York City. The "Mayan" Hot Chocolate has the most charming packaging. I loved how MarieBelle hot chocolate is so chocolatey. There's almost no sugar in the blend. In fact, I needed to add a teaspoon of sugar after I prepared my cup of hot chocolate. The richness reminded me of Angelina's in Paris. The Mayan blend is slightly spicy and has a touch of coffee, but not enough to notice. If you want to try a Vanilla Cupcake that is to-die-for, take a quick detour to Georgetown Cupcake. How do they make the cupcake so moist and the frosting so packed with vanilla flavor? This was the best cupcake of my life! Yum!!! Balthazar Bakery is a traditional French bakery in the heart of SoHo. If you ignore the New Yorkers pushing behind you in line and forget that everyone is speaking English, you could imagine that you were in France. I was surprised to learn that Balthazar Bakery has only been around since 1997 because it has the air of a historic institution. The selection of pâtisserie doesn't get any more classic than this: Raspberry Tart, Baba au Rhum, Opera Cake, Saint-Honoré. Ooh, la, la, I loved this place! Originally from the French Riviera, François Payard is a third-generation pastry chef who brings tradition and passion to his craft. His training is impressive, including a stint as pastry chef at the 3-star Michelin-rated Tour d’Argent in Paris. In 1997, Payard realized his childhood dream and opened his pâtisserie shop. His exceptional pastries have earned high praise and Payard has won many awards. In 2006, he was listed as one of the 85 Best Pastry Chefs in the World by the Relais Desserts International. Be sure to try the Papa Payard Tart. This simple baked fruit-custard tart is made with seasonal ingredients and a brown-sugar puff pastry crust. 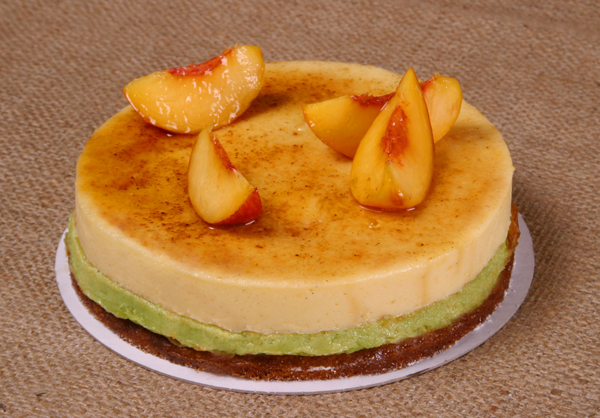 Payard makes an excellent mousse cake featuring a layer of peach mousse and a layer of pistachio mousse over a butter-crust tart shell. I love the presentation with fresh peach slices. For something light and fluffy, go for the Vanilla Gateau Roule. 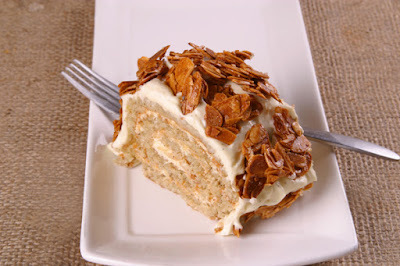 The airy genoise cake is rolled with a layer of vanilla mousseline cream and finished with candied toasted almonds.